Play Alter Native, originally uploaded by am4ndas. An updated version of Video Projection Tool is now available. Version 4.0 had a lot of under the hood changes, which unfortunately introduced some bugs. Hopefully most of them have been taken care of with this update. There are also a few new features: different blend modes and a global moviesource drop zone. Read the list of updates on the VPT page. The image is taken from a project Amanda Steggell is doing for the theatre company Verk, where she is using the new blend mode feature for her beautiful emoticons video design. Perceptual meltdown after Granular Synthesis retrospective at the STRP festival in Eindhoven, in the old Philips facilities in the Strijp area. 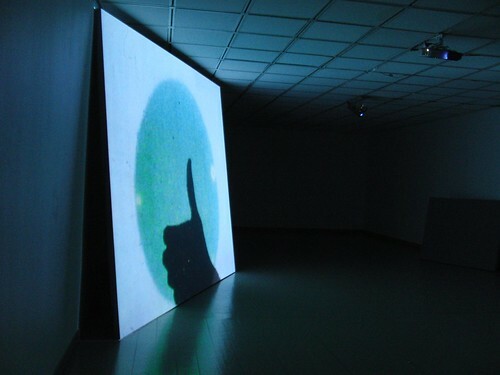 The festival´s focus this year was a retrospective on maximalists austrian media art group Granular Synthesis. It was a unique opportunity to see a lot of the group´s work as well as newer work by the two members Ulf Langheinrich and Kurt Hentschläger. If you have ever seen any of their work before you would guess that this would be an overkill event, and you are right. The works are intense audiovisual bombardements, they physically attack your senses and that does something with your body and mind. 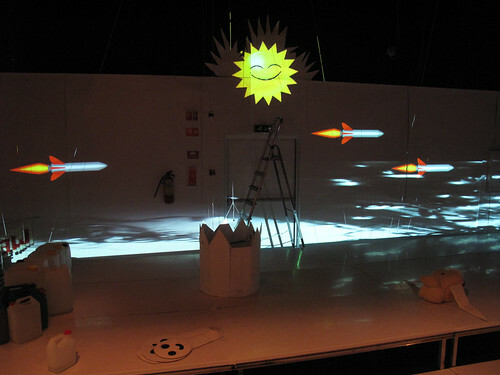 The Granular Synthesis performance installations POL and modell 5 are large scale multiple projections with a corresponding large sound system, which worked well in their monumental way in the factory space. The solo works are not that large-scale, but more intense. Ulf Langheinrich showed Hemisphere (which I mentioned earlier from the exhibition “from spark to pixel”) and Drifter. 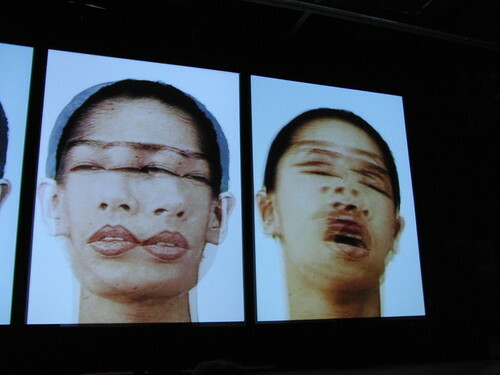 Kurt Hentschläger showed Cluster and Zee, which could be seen as offsprings from his ARS electronica performance Feed in 2007. Zee is basically a room filled with smoke, with stroboscopic images projected into the smoke. You loose all reference to the physical space and experience psychedelic visions. All their works relate to perception, and it was an interesting coincidence that I was reading The Space between our Ears while I was at the festival. It was a bit strange to experience Granular Synthesis at STRP, since the audience is mainly a quite young techno crowd, and the difference between a trippy techno party and an installation like Zee is pretty vague. Apart from the retro media artists there wasn´t so much of interest at the festival, the exhibition was a mix of two trends in the media art scene: The commodification of media art on the one side: beautiful objects in perfect collector size, and the technology fascination on the other side. The Strijp area contains more than the festival. 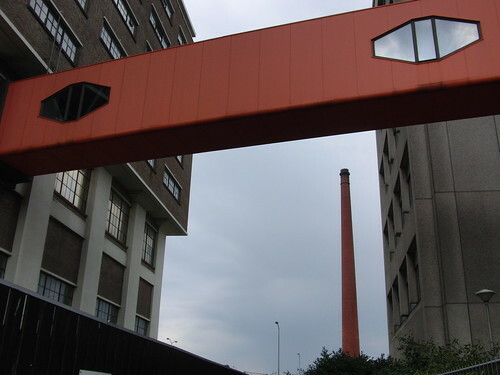 It is the site of the former Philips research lab Natlab, in the art world probably best known for the creation of le poéme electronique, a collaboration between LeCorbusier, Varese and Xenakis for the World Expo in Brussels in 1958 (I will probably write a bit more about this in a separate post). The old Natlab is now dead, but last fall Baltan laboratories emerged in another part of the Strijp complex, a media lab with a fantastic space and with interesting artists like Telcosystems and Geert Muul involved. I will give a presentation there in the end of may as part of their monthly public Natlab sessions. I have known New Zealand artist Len Lye´s films for a long time, but was unaware of his kinetic sculptures until recently. I found the Universe sculpture from 1976 especially interesting. The Len Lye foundation did a remake of it in 1998, completely silent except for the sound made by the steel. You can find several of Lye´s films by doing a search on youtube (although the quality isn´t very good), Free Radicals and Swinging the Lambeth Walk are two good examples of his work. What makes them really stand out today is the combination of the experimental nature of the visual side with the soundtracks of african drums and happy jazz. There are two documentaries made on Lye, Doodlin´: Impressions of Len Lye, and A Flip and Two Twisters. Roger Horrocks has written a biography on Lye, but it seems to be available only as a collector´s item at the moment. Horrocks has written a new book, Len Lye – ART THAT MOVES – which will be published by Auckland University Press in November 2009. Here is a website which gives a good overview of the work of Lye. Re-voir has a collection of Lye´s films on VHS (thanks again to Pip Chodorov). 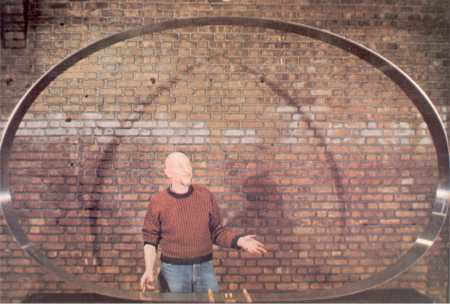 And check out my quite extensive post on kinetic art. The last two weeks has been dedicated to moving objects. First, Lawrence Malstaf gave a workshop, and this last week the swedish artist Lars Brunström was in Bergen, partly to teach at the academy, partly to help me with the prototype for an upcoming project. Brunström gave a lecture about artists working with kinetic sculpture, showing examples from some well known and some lesser known artists. I have collected some links to some of the artists he talked about, plus some other artists and projects related to kinetic art I have seen the last few years. This list is by no means exhaustive (and it points in all directions), so if you think there are other artists who should be mentioned, leave a comment. The film portrays people who in different ways enjoy a close relationship with a robot. We meet an old German woman who desperately seeks to keep her memories alive through talking with a baby seal robot called Paro. We also meet Professor Ishiguro who is developing androids, and who, in his current work on his own geminoid, wonders what it takes to be human. The robot is no longer just a mechanical gadget that sits inside your coffee machine or performs monotonous, mechanical work, but made to provide meaningful presence. and while we are in the robotics section, here is a link with some great images of contemporary robots. Last, but not least, check out Lars Brunström´s website with his own work, including the sloth at the top of this post. I have added a separate post about Len Lye. Last week I was in Budapest for the first time, a fantastic city! I was invited to take part of a Touch – Punkt event as part of the Temps d´Images festival. The Touch label came with Mike Harding and Jon Wozencroft which gave a short seminar, and with the artists BJNilsen(laptop) and Hildur Ingveldardóttir Gudnadóttir (cello). The concept of Punkt, which is a festival in Kristiansand run by Erik Honoré and Jan Bang is to sample a concert as it is being played, and using that sampled material as the basis of their own concert following straight after. They had invited Sidsel Endresen to join them on vocals, and Andras Halmos from Trafó had invited me to create the visual part of the concert. I wanted to stick to the concept of using the first concert of BJNilsen and Gudnadóttir as the departure point for my video. I created a very long image buffer, 12000×480 pixels. For recording, I could move sideways through the buffer and add images into the buffer, and eventually adding layers of overlapping images as the two concerts progressed. The image above is a small sample of what the buffer looked like at the end of the concert. For playback I had a very slow horisontal movement, so it would take several minutes to move through the buffer. I wanted the recording head to move faster than the playback head so the images wouldn´t appear in a chronological order, and which also created some interesting layers of time. Unfortunately I still don´t have any good images from the concert, the one at the top of the post is taken from my video camera with nightshot on, but you get an idea of the scale, it was a huge image behind the performers. I was also supposed to do an hour presentation at Kitchen Budapest for maybe 10-15 people, but they convinced me to participate in a tech-pecha kucha event (so 20 slides, each showing for 20 seconds= 6min 40 sec) at the Merlin Theater with 300-400 people in the audience, so that was a strange but interesting experience. My impression was that people were sincerely interested in the content, my previous experiences with pecha kucha events has had a strong focus on entertaining, but superficial presentations. By a weird coincidence one of the other presenters was Maté Gaspar from the theatre company Krétakör (website in hungarian) who I had been in touch with a year ago, so I got to visit their amazing workspace. I also got a short tour of the Kitchen Budapest facilities, and finally met Adam Somlai-Fischer, who was supposed to be part of my seminar last fall.